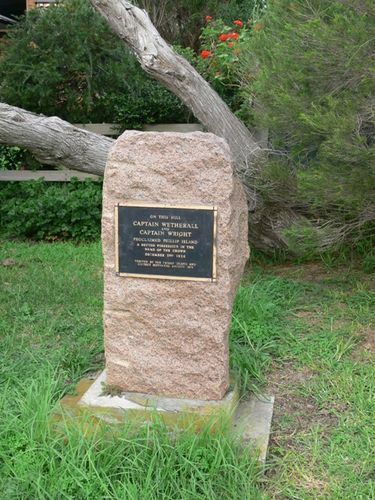 A monument commemorates the proclamation of Phillip Island as a British possession in 1826. In 1826, the scientific voyage of Dumont d'Urville, in command of the corvette Astrolabe, led to British concerns of an attempt by the French to establish a colony in Western Port. This saw the dispatch from Sydney of HMS Fly, under the command of Captain Wetherall, and the brigs Dragon and Amity, by Governor Darling. While the French colonisation did not eventuate, Wetherall reported on finding a sealer's camp and also two acres of wheat and corn. A fort was constructed near Rhyll, and named Dumaresq after the Governor's private secretary. The 'abundance' of wood, quality soil and the discovery of coal at Cape Woolamai, were mentioned in newspaper accounts.Wetherall also erected a flag staff on 'the flat-top'd rock off Point Grant' (commonly known today as The Nobbies) on the Island's Western extremity as a marker for the harbour entrance.